Grandma’s Thanksgiving Recipe – Tradition or Experiment? As Thanksgiving approaches and Americans all over the country prepare to stuff their stomachs with their traditional family feasts, I decided to attempt to make my grandmother’s cranberry orange salad. We’re having Thanksgiving in Florida again this year, half the country away from my family in Michigan, but I wanted to try something new – something exciting and special. I first had my grandma’s cranberry salad last year at Christmas (one of the two times a year I can afford to go home) and I was so obsessed with its tangy, sour delight, that it nearly surpassed my favorite Christmas food of all time – Aunt Jan’s make-ahead mashed potatoes. As I ate the cranberry goodness, I couldn’t help but feel so happy inside. Yes, it is delicious. But I was so proud of my grandma for taking the time to make it and sharing it with our family, even though I’m sure it had gone unappreciated many Christmases before. I was proud of my grandma, that in her old age, with her shaky hands and severe arthritis, she would take the time to make this family recipe – a recipe she learned from her own mother, many years ago. – She grinds the cranberries, orange, and apple in an old-fashioned, hand-cranked grinder. It produces a lot of wonderful, very sour juice. Save the juice for enjoyment later. Don’t know if a food processor would work, but worth a try. Add the sugar. Set aside. –Add boiling water to jello mix. She did not remember if it is 1 1/2 cups of boiling water, or 1 cup boiling water (as per package instructions) and 1/2 cup cold water to help it set up. Chill the jello until just partially set. Mix in the cranberry mix. –“Then you must do something with the extra 1/2 teaspoon of orange rind. . . this is Grandma Burnett’s recipe from Arlington, I remember copying it in her apartment and she wouldn’t have had that in there if she didn’t use it. . . no, I don’t remember how I make it. . .” Maybe the orange rind is sprinkled on top? Or mixed in for even more orange flavor? Give it a try. I glanced over the ingredients a while ago, excited that I could find most at the produce stand around the corner. (Even Michigan-grown cranberries!). But as I read each line tonight, attempting to make this divine dish, I realized one thing: My family is not good at communication. I don’t have a hand grinder or a food processor – so a blender had to do. Mixing ingredients, I realized that I had something more like cranberry soup – not a scoop-able mixture that will soon resemble a salad. Frustrated, I thought about just freezing the cranberry mixture and eating it like sorbet tomorrow morning. I thought about using it in my smoothies or even putting it over pancakes. But no, that was not the recipe. That was not my grandmother’s recipe. While the instructions leave lots of room for improvisation, this is still my family’s recipe for cranberry orange SALAD, not sorbet, smoothies or pancakes. I called my mom to clarify directions, discussing the process step-by-step, as she tried to recall exactly how my grandma used to make it. Describing what I was staring at in my mixing bowl (and what I was wearing all over my shirt), it was debatable as to whether or not my work would turn out to be edible. As tempting as it was to call it a night with what I had, I wanted to try and make this delectable holiday salad my grandma ate growing up as kid – a recipe that my mom remembers from her own childhood – a recipe that (if I can get it right), will be a part of my own family’s holiday traditions someday. As I write this post, it is still unclear if I even have cranberry orange salad or just cranberry orange goo. But at least I can call my grandma tomorrow, wish her a happy Thanksgiving and let her know that one of her fond childhood memories is a now part of another generation. Just in time for the start of holiday shopping are new cords and gear, here at TKG! We’ve added paracord with reflective tracer, glow-in-the-dark paracord, colored contoured side-release buckles and we’ll be debuting a ton of new bracelets shortly. Don’t forget that we specialize in custom orders and have some of the best prices you’ll find online. In just over the 2 years we’ve been open, we have over 1,400 sales! Check out Top Knotch Gear’s sweet selection here. An hour ferry ride outside of Hong Kong shines the casino-dominated, Portuguese colony of Macau…Asia’s Las Vegas. CNN’s international page, CNN GO, says it has been 5 years since the gambling revenue of Macau has surpassed that of Las Vegas, Nevada here in the States and is now the world leader in gambling revenue. 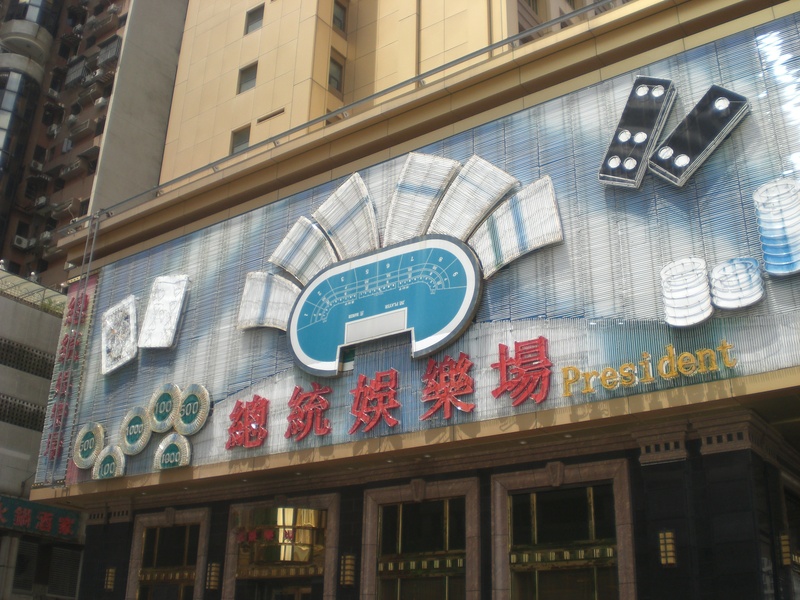 Because gambling is illegal in Hong Kong, locals and tourists flock to the island to try out their hands at Blackjack and the slots. There are multiple ferries leaving various ports in Hong Kong, just be sure to bring your passport as the trip is considered international. (Macau is technically part of China while Hong Kong is not. So you need a passport). 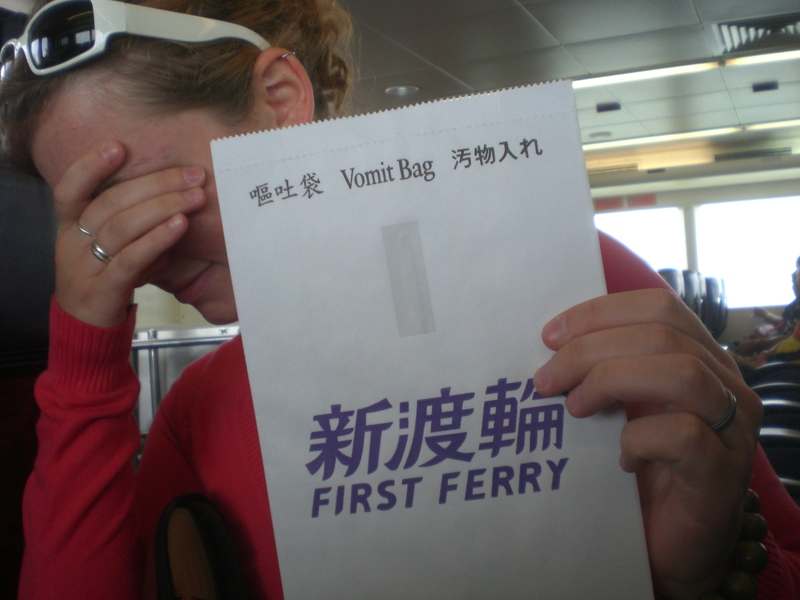 My first time on the ferry, I was about 3 days into my malaria pills, prepping for my trip to Thailand. I was very seasick and the hour-long ride felt like a 12-hour ride! Me on the ferry, feeling very sick! 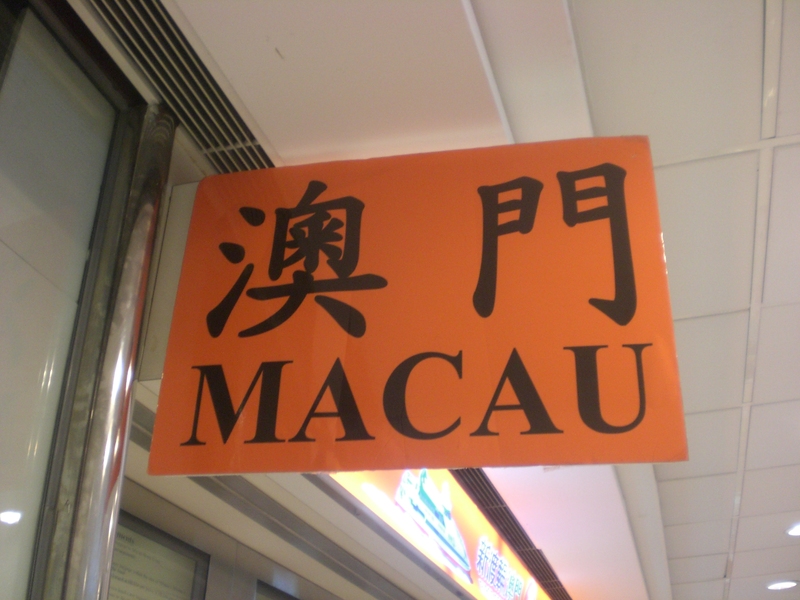 Macau is very unique in that you’ll find street signs in both Cantonese (the main language of Hong Kong) and Portuguese, Chinese food on the streets and European gothic buildings at the city square. Every time I have been to Hong Kong, I book a ferry ticket to Macau and roam around for the day. 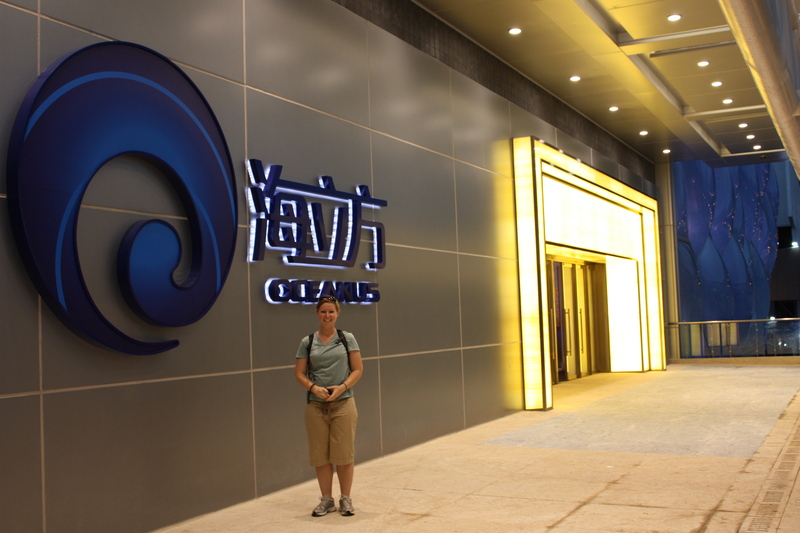 The last time I was in the casino, I even won 40 yuan (which converted to about $6 USD). 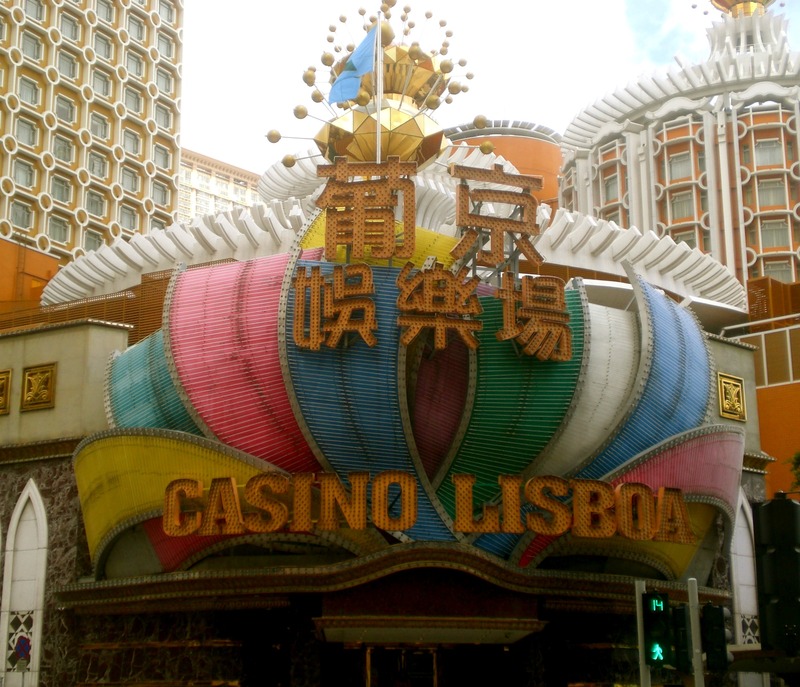 Casino Lisboa is one of the most well-known casinos in Macau. Built in 1970, the inside rooms are strung with diamonds that make it look like something right out of a James Bond film with Sean Connery. (You aren’t allowed to take pictures inside at the gambling tables, so you just have to take my word for it). I visited this casino with a travel buddy and guy we met at our hostel, and when we entered the Blackjack room, we were definitely out of place. Everyone else was in tuxedos and designer dresses (we went into the high stakes room), so you can imagine how surprised everyone was to see a couple of backpackers in capris and sweaty t-shirts. 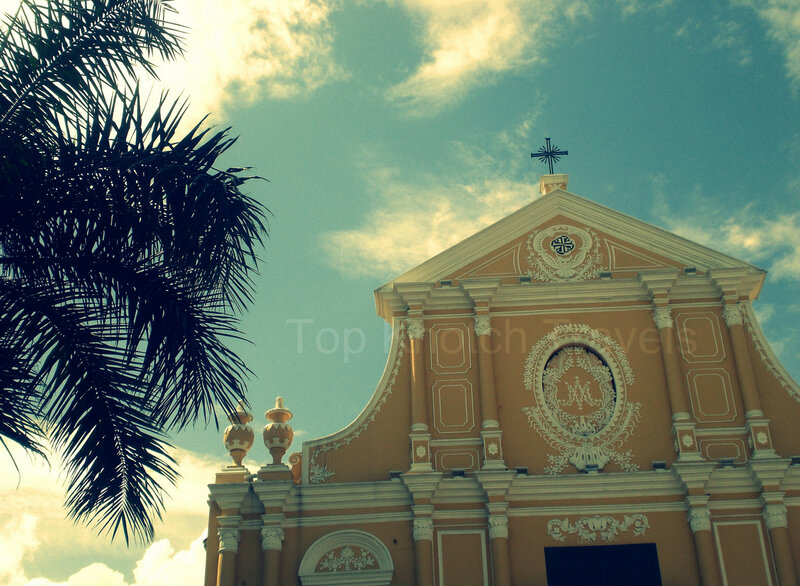 In Senado Square (the city square in the middle of the town), you’ll find St. Dominic’s Church – an old Catholic church that is now a UNESCO World Heritage Site. 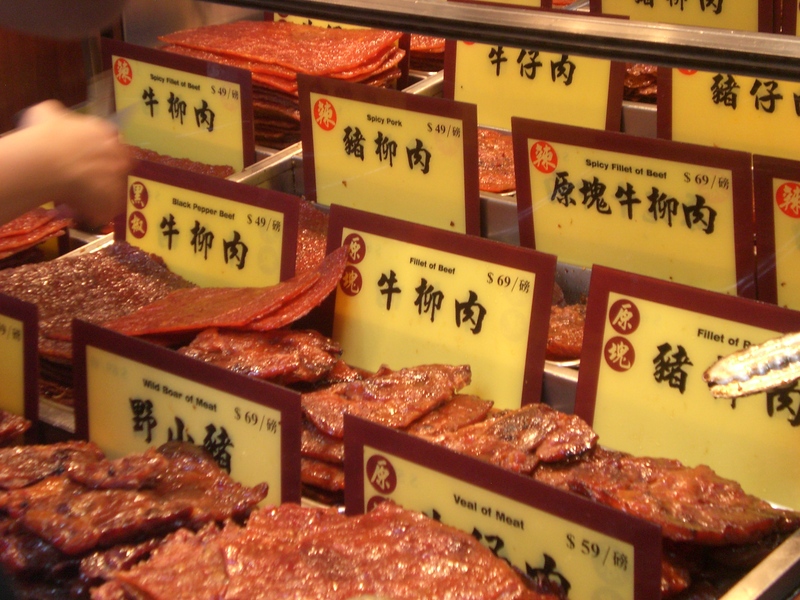 As you walk further up the street, you pass tons of food vendors selling meats of all kinds of animals, delicious-smelling cookies, t-shirt shops and store owners selling their colorful kites. 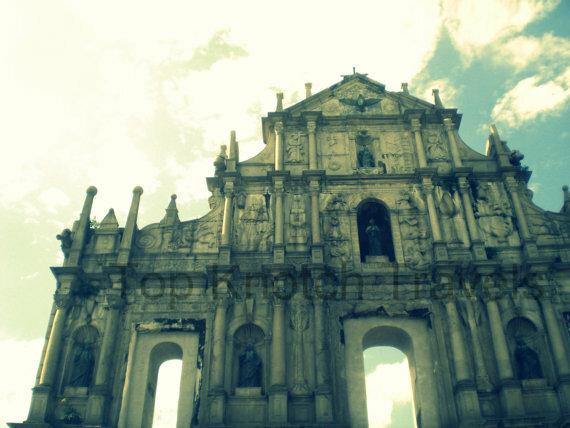 It’s at the top of the hill that you’ll find the historic ruins of St. Paul’s Cathedral – one of Macau’s most famous landmarks and another UNESCO World Heritage Site. For more info on St. Paul’s, check out Fun Tourist Attractions! 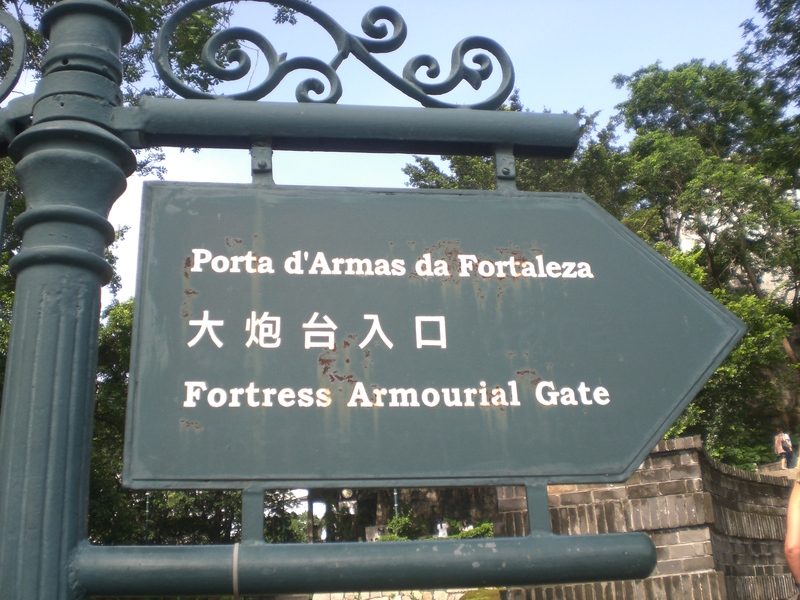 Next to the Cathedral is Fortaleza do Monte – Mount Fortress, which used to be the fortress of Macau. (Another UNESCO site). 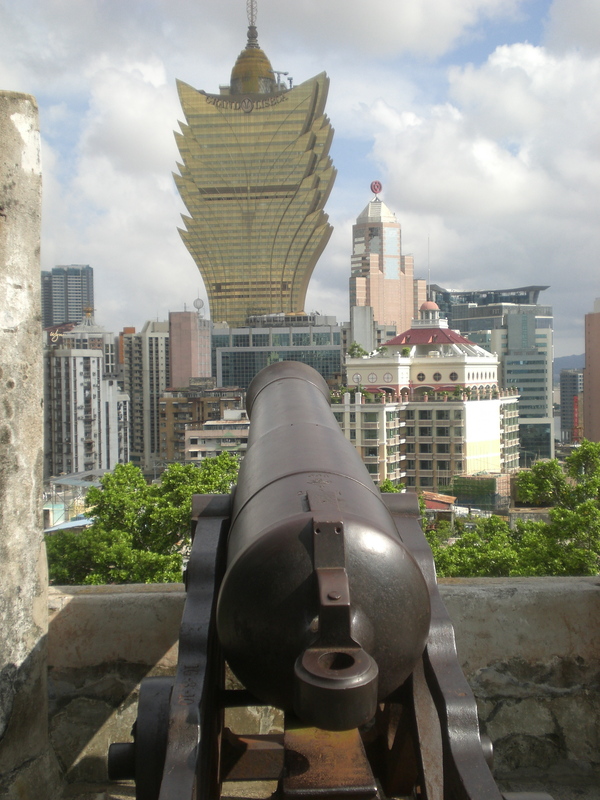 If you climb the stairs to the top of the fortress, you can get a great 360-degree view of Macau! 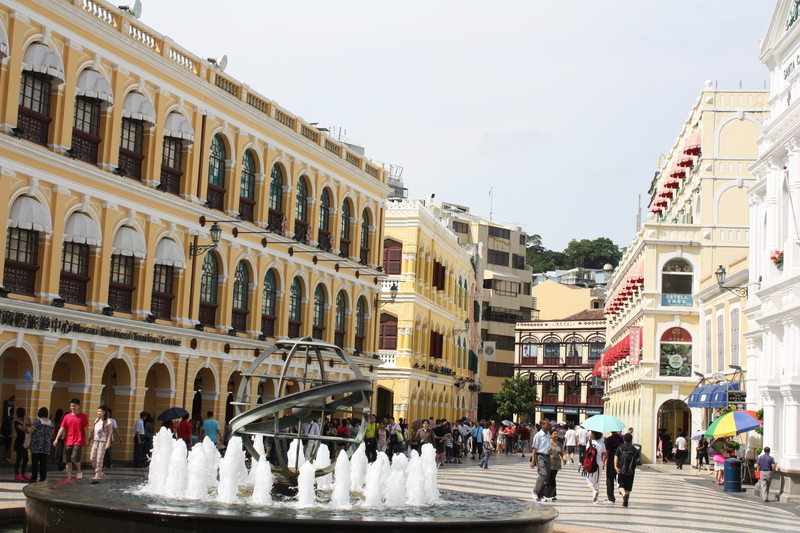 Whether you’re in Macau to gamble, site-see, walk through this historic colony or eat the delicious Portuguese food, it’s definitely worth the ferry ride if you can tear yourself away from Hong Kong. If you’re walking around the city (although, there are taxis and buses), be sure to keep an eye on the weather. During my most recent trip, my friends and I were caught in monsoon-like rains! This picture was taken right before the rain hit!